Trapped nerve symptoms like sciatica can be treated at Solihull Sports Injury Clinic. 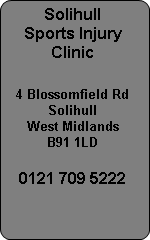 Atlas Sports Injury Clinic have a Solihull osteopath and Solihull physiotherapist experienced in treating a trapped nerve. Trapped nerves can be found mostly in the low back where the nerve root exits from the spine and can be divided into mechanical impingement or chemical irritation. What this means is something physically is pushing against the nerve like a bulging disc or piece of bone or the disc has been damaged and the contents of the disc have spilt out over the nerve causing a chemical irritation. Nerve pain is very distressing and not easy to treat with oral medication. Generally strong medication will leave you drowsy and is something you should use as a last resort. Treatment is varied depending on the cause of the nerve irritation. A trapped nerve is a general description used by patients suffering from nerve root irritation. It may be sensory or motor nerves that are affected and sensory symptoms range from pins and needles, numbness, tingling and a shooting pain whereas motor nerves show no pain but affect function and strength of muscles. Diabetes neuropathy or pathology such as MS, Motor Neurone Disease or a Stroke can affect the nerves so care should be exercised when examining the patient. In many cases the culprit is a bulging disc or prolapsed disc in the neck or low back. This can be resolved with the correct physiotherapy in most cases but in more urgent severe cases surgery might be required.